Everyone loves a good partnership, because collaboration leads to success. 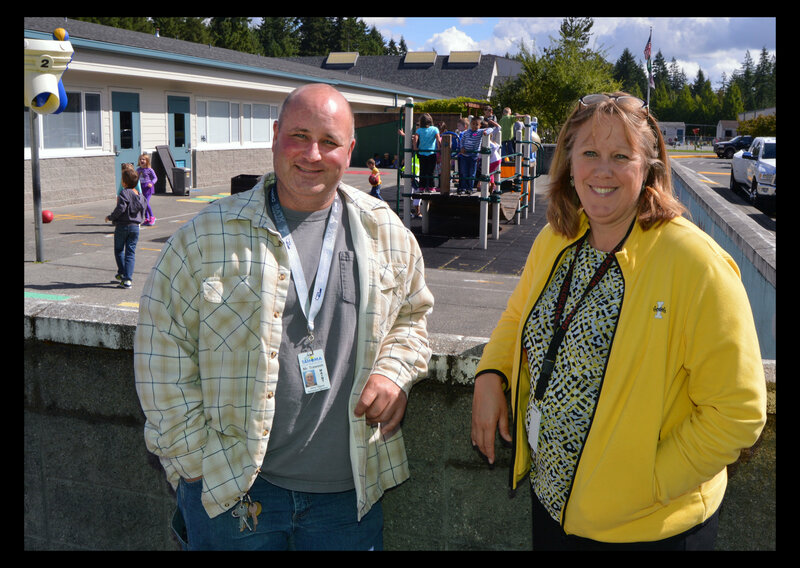 Just as Gotham City is made safer by Batman and Robin, Tahoma School District’s indoor air quality and safety standards are benefiting from a partnership between Elliott Traweek, the maintenance supervisor, and Cindy Darcy, the purchasing and risk agent. Prompted by a transition of Cindy’s role into facilities, Elliott and Cindy have worked as a team to focus on preventive maintenance and repair. This collaboration has improved district indoor air quality, hygiene, and safety, as well as communication both internally at the Maple Valley based district and with the Puget Sound Workers’ Compensation Trust (PSWCT). Proactive and preventive are two key words we encourage all of our districts to incorporate into their daily vocabulary. Preventing unnecessary harmful exposures in the workplace, whether they are in respect to safety, indoor air quality, or chemicals, is imperative to striving for an injury-free workplace. Elizabeth Jakab (EJ) has worked closely with the team and recently sat down with them to learn how they collaborate for success. EJ: Tahoma School District has a great strategy for addressing Indoor Air Quality (IAQ) issues. Where did you learn about IAQ? Elliott: I am a Washington State licensed journeyman in refrigeration and have a thorough knowledge of HVAC. I also have a strong facilities management background, including working with McKinstry for 15 years where I managed 30 buildings. Cindy: Elizabeth Jakab, from PSWCT, has guided my education in the area of indoor air quality. Tahoma has some amazing historic facilities that have offered some challenges with water intrusion and aging HVAC systems. As Elliott mentioned, he has a strong background in HVAC and we have both learned quickly working with Elizabeth. EJ: What have been the most impactful changes you implemented at the district? Elliott: Improvements to the HVAC system have been significant. We checked all building systems in the district and corrected all failures. Cindy: I would also add that we have implemented some cleaning standards and offered more custodial training. We have also partnered with great suppliers and remediation contractors. By standardizing our procedures on carpets and cleaning strategies district-wide, we have saved time and money. EJ: What prompted your collaboration? EJ: A good part of your work is responding to and solving problems. But above and beyond that, what kind of proactive measures have you implemented? Elliott: One of the new proactive plans is for Cindy, me, and the building custodian to do scheduled IAQ site walk-throughs in all buildings. We are currently preparing the schedule for the upcoming school year. EJ: What is the role of communication in your work? Elliott: Communication is very important in a school setting. In IAQ issues we use the work order system, emails, phone calls, and face-to-face meetings. We make sure that concerned staff understand the issue and the resolution. This kind of communication also includes quite a bit of IAQ education. Cindy: I have come to realize that lack of, or poor communication can really exacerbate issues. Face-to-face and phone calls work best. I learn something new every time I have a conversation with staff – they are the experts for their classroom or work area. EJ: Do you use outside resources and support in dealing with IAQ issues? Elliott: Yes, definitely. As you know, PSWCT services have been very helpful. In addition, we have a number of companies on contract to help us with larger issues on remediation, plumbing, roofing, and HVAC. On a few occasions we contacted the State Department of Health’s School Environmental Health and Safety representative for collaborative problem solving. Cindy: RESTORx DKI of Washington has been our primary remediation contractor. They have also been very knowledgeable. EJ: How do you define success in the IAQ area? Elliott: The knowledge that work is done correctly. We actually solve problems and do not just apply temporary Band-Aids. Cindy: Happy, healthy staff and students and not having to review student absence/illness statistics to ensure our IAQ is good. EJ: What are your biggest successes? Elliott: The implementation of our initiative to standardize the use of chemicals, cleaners, and disinfectants in the district and the support we got with this initiative. Also, all the positive feedback we receive from employees, principals, the school board, and even the community about the IAQ improvements. Cindy: Also, the collaboration with Elliott’s group and myself. I am hoping that we are gaining trust from staff that concerns will be addressed. EJ: The biggest challenges you face? Cindy: We have a lot of “under-the-counter” disinfectants, air fresheners, and cleaners that still reside in classrooms. I believe in baby steps. By providing staff with safe, standardized, and adequate cleaners, I am hoping we can begin to clear out all the non-maintenance purchased items. EJ: Plans for the upcoming school year? Elliott: As I mentioned, the implementation of the walk-through plan and the classroom chemical management plan. From now on staff is not allowed to bring in or request parents to supply cleaning chemicals, wipes, or disinfectants. Staff can use diluted cleaners provided by the district, but all disinfection will be strictly done by the trained custodians. Cindy: In preparing for a district-wide facility move in the summer of 2017, we are calling 2015 – 2016 the “Year of the Purge and Clean.” We are trying to make it as easy as possible for staff to dispose of and surplus unnecessary items. It will be a fun year, hopefully with continued improvements in our buildings’ IAQ. Congratulations to Cindy and Elliott for the success. Tahoma sets a great example for all of us as we work toward healthy work environments.